/ Paintball: Is It a True Sport? Probably by this time, you are still thinking whether paintball is really a true sport. Do not worry, we will try to help you understand the definition of paintball and the things why we should play the game. In this way, we will have a clear understanding of it therefore, we can answer our doubts on paintball being a sport. Maybe some of you still haven’t heard the word “paintball” or if you do, you do not have any idea about it. This is quite evident as the popular sports played today are those frequently facilitated in schools or tournaments that we have forgotten about the past ones that were earlier created and invented. Let us first discuss what is paintball and its background. 3 Is Paintball a Sport? 4 Why We Should Play Paintball? Paintball was created way back in the 1980s. This involves players eliminating their opponents during the game through hitting them with balls made of dye, oil, and gelatin which are purposely made to be breakable. These are sometimes referred to as “pellets”. It is typically released from a paintball marker which is powered by carbon dioxide and compressed air. This game is played in several tournaments and competitions participated by professional players. It is not only applied in games but also in the military. It is used as a military training by military forces and security groups. Paintball can be played on indoor or outdoor fields. The size or type of field is up to the players. It is a must for this game to either have natural or artificial terrain which is used by the players as their cover. The goal of the game can be eliminating the opposing team, successfully getting the flag, defending or attacking a specific location or getting the hidden objects within an area. It is also referred to as the “paintball gun”. It is the main equipment of the game as it is used to shoot the enemies and eliminate players. A paintball marker needs to have a loader. It can also have magazines attached to it to keep it functioning alongside the paint. Today, markers require tanks which use compressed air and carbon dioxide. However, disposable capsules were used in the early years after the invention of the game. In the present, there are improvements made when it comes to paintball markers. Some of them include enhanced firing rate and availability of different sizes and pressure capacities for particular likings of the players. This act as the projectiles used by the paintball marker. It is spherical in shape, gelatin capsules which contain mostly of polyethylene glycol, dye and water substances. Their quality mainly depends on the ball shell’s brittleness, the shape of the sphere and the fill’s thickness. Those balls with very high quality can almost be perfectly spherical with just a thin shell to ensure that it easily breaks upon impact. They also have bright colors so that they are hard to wipe off. Most of the paintballs manufactured are biodegradable. They also come in several sizes. These are equipment to protect the players from the shooting of paintballs. The former types used in the past are safety goggles, those that are used in labs and wood shops. Today, the goggles have similarity to snowboarding goggles. Those cover the face of the one wearing it. Some may also come with a throat protector. This attire is originally from motocross. The idea was also inspired by BMX. However, the players adapted it to the game so that they have something to protect them from certain injuries or incidents. Another equipment used for the protection of the players. This can be observed in several other sports which are fast-paced games. This is used to protect the players from hits that might hurt them bad. The game largely depends on the specified agreement before the game starts. The basic rule, however is to be able to shoot the opponents using their paintball markers and leave a mark. Those left marks must be the size of a quarter or bigger. Those eliminated players are to leave the game unless there is a rule to keep them on the field. There are several goals which the players can choose from. The two most common are elimination and capture the flag. 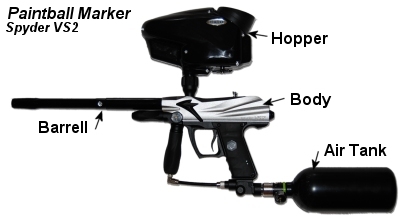 Paintball has many variants. These include woodsball and speedball in which you can have the freedom to modify some of the rules to fit your style. I know that this is the most important thing that you want to know. Is paintball really a sport? Yes, it is! Paintball comprises of opposing teams. The game organized has its own rules and goals. For you to be able to play paintball, you need to engage in physical activity and fast-paced movements that are very essential to achieve success in the game. It may be played indoors or outdoors and it also comes in different variations. Why We Should Play Paintball? One of the important things that should not be forgotten is that you have to enjoy any sport that you play. It is vital because if you enjoy playing a particular sport, you can use your time in a wise manner and not overlooking the physical engagement that you can get. Socialization- We know for a fact that most sports require you to socialize. Sports require teamwork for you to achieve the goal in whatever game you play. It is through sports that you get to know each other and form bons and links. Challenging- Every sport has its own rules and objectives. This must be followedin order to have ordely, just ad organized game. The goals in each sport may vary. But it is those difficult ones that make us feel pumped and excited. In paintball, you need to think of strategies to defeat the opponents. Therefore, it gradually becomes challenging as the game moves on. Variety of Choices- Paintball has several different variations. It could be woodsball or speedball. You can also modify the rules of the game depending on the agreement before the game. This gives you the freedom to play your preferred type of game. Physical Activity- Paintball is a fast-paced game. If you want to defeat your opponent, you have to be alert and fast and that way you can engage yourself in some form of physical activity that will definitely benefit your health if done in a good way. Now, we have defined what painball is its rules and gameplay. We have also identified if paintball is a sport – the thing we want to know the most. Lastly, we have listed down the reasons why we should play paintball. We hope that we have enlightened your minds on this subject!